Lama Jampa was born in England in 1952; he became a student of Karma Thinley Rinpoche at the age of 20 and met His Holiness 41st Sakya Trizin a year later. Karma Thinley Rinpoche bestowed upon Lama Jampa many initiations, transmissions and instructions from the Kagyu, Sakya, Nyingma and Kadam traditions. In particular, he received from Rinpoche the famous collection of vajrayana initiations known as the One Hundred Sadhanas of Bari Lotsawa, the One Hundred Lojong Teachings, the complete cycle of Konchog Chindu and various works on Kagyu philosophy. From His Holiness 41st Sakya Trizin, Lama Jampa has obtained many initiations and transmissions from all four sets of tantras, most notably the Thirteen Golden Dharmas, Lamdre Tsokshe, the esoteric teachings of Vajrayogini, the Jonang Transmission of the Eighty Four Mahasiddhas and the One Hundred Sadhanas of Narthang. A third master who was particularly important in Lama Jampa’s education was Ngor Phende Shabdrung Rinpoche (b. 1934), from whom he received numerous initiations, textual transmissions and instructions, such as Vajrayogini, Vajrapani and White Tara. Having completed the Kagyu Mahamudra preliminaries by 1975, Lama Jampa went on to complete the retreat of the development and completion stages of Konchog Chindu as well as the retreat of Amitabha. Over the following years he completed White Tara, Vajrayogini and Hevajra, the chief retreat practices of the Sakya tradition. In 1975, following a visit to Manchester of His Holiness the Sixteenth Karmapa and with the blessing of Karma Thinley Rinpoche, Lama Jampa established the first of the worldwide network of Buddhist centres and groups dedicated to the study and practise of the teachings of either Kagyu or Sakya schools. In 1977, Lama Jampa was appointed by Karma Thinley Rinpoche as his dharma-regent and subsequently in 1988, as a result of his completion of the necessary retreats and textual studies, he was given the authority to carry out the activities of a lama, such as bestowing vajrayana initiations. Since then Lama Jampa has travelled extensively giving teachings and initiations in many countries and also establishing permanent centres and groups as requested. By August 1989 these included a European retreat centre - Sakya Changlochen Ling - and it was at this time that Karma Thinley Rinpoche bestowed the collective name of Dechen on the network. Originating from the first line of a poem by Rinpoche: ‘great bliss (dechen) is the antidote to laziness’, it now has centres in USA, Mexico and Germany as well as France and the UK. Before passing away in June 2014, Shamar Rinpoche, who alternates with His Holiness Karmapa as lineage holder of the Kagyu tradition, requested that Lama Jampa visit and give teachings at his Bodhi Path centres worldwide. Since this time Lama Jampa has travelled to Bodhi Path centres in USA and Europe in order to fulfil Shamarpa’s wish. Lama Jampa Thaye is the author of various works including Garland of Gold (1990), Way of Tibetan Buddhism (2001), Rain of Clarity (2006) and Wisdom in Exile (2017). His books and essays have been translated into French, German, Polish, Spanish, Portugese and Bulgarian. He holds a doctorate from the University of Manchester for his work on Tibetan religious history and lectured for over twenty years at the University of Manchester and Manchester Metropolitan University. He edited and wrote the introduction for Karma Thinley Rinpoche’s The History of the Sixteen Karmapas of Tibet (1980) and composed the entries on Tibetan religions for The Dictionary of Religions (1980). In 1974 His Holiness the Sixteenth Gyalwa Karmapa appointed Lama Jampa to the Karma Kagyu Trust (UK) and he is now a member of the international teaching faculty of the Karmapa International Buddhist Institute in Delhi. In 2010 Lama Jampa was invited to attend The World Buddhist Summit as the UK’s Supreme Head of Buddhism. 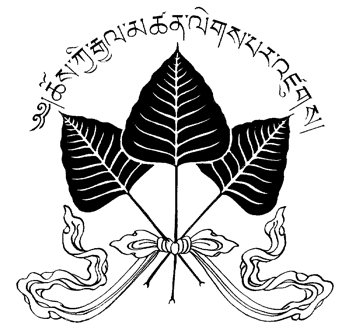 Established in Japan in 1998 the purpose of the organisation is to bring leaders of the three major Buddhist traditions together (Theravadin, Mahayana and Vajrayana) in order to promote the teachings of the Buddha as a vehicle for world peace. Lama Jampa Thaye lives in Bayswater, London with his family. He maintains a busy annual program of teachings and initiations for Dechen and other international dharma organizations and personal interviews at the request of his students. Supreme scholar, Lama Jampa, may you live long."